modest musings: NEW! Letterpress Stationery from Austin Press & Smock. NEW! Letterpress Stationery from Austin Press & Smock. Hello all you lovely people! 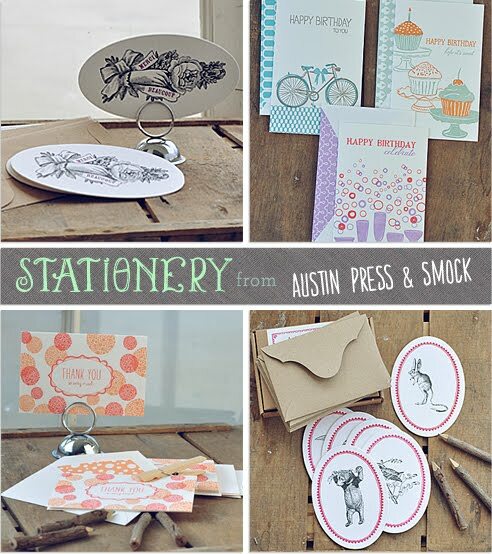 We just added some letterpress stationery items from two of our favorite companies - Austin Press & Smock. Austin Press designs are inspired by old books, vintage ephemera, Victorian typefaces, and all sorts of whimsy! 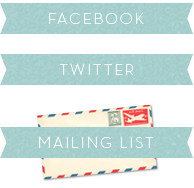 Creative genius and artisan, Kimberly Austin creates beautifully hand-crafted stationery that can be cherished forever. Each exquisite piece of work has been printed and assembled by Kimberly herself using a 19th century old-style letterpress in her San Francisco studio. We are proud to offer the works of this talented artisan in our shop! We at Modest Peach are in love with all things pretty, and the Smock stationery line has completely won us over with prints of some of our favorite items: cupcakes, bicyclettes, champagne, and even hippos! With so many fun and quirky designs to choose from in oh-so-pretty colors, you're definitely in for a whole lot of paper eye candy. One other thing that we love about Smock is their commitment to being a truly green letterpress print shop, being the first and only print shop in the U.S. to offer printing on sustainable and 100% renewable luxuriously thick bamboo paper. In a world of e-mail and texts, we can't think of anything that shows gratitude and appreciation more than a beautiful hand written note on an elegantly textured letterpress card printed on the finest quality paper. Keep checking our website periodically, as we will be adding more home decor and stationery items in the very near future. Have you been swooning over one or more of our products? Is there anything you would like to see from us in the future? Let us know! We are open to any and all of your suggestions!